At the very heart of Paris can be found its two famous Gothic churches: Notre Dame Cathedral and Sainte-Chappelle. Both are justly famous. Construction for Notre Dame began in the mid-twelfth century and wasn’t completed until the mid-fourteenth. The French Revolution was not particularly kind to the cathedral church of Paris, having been converted from Christian church to revolutionary temple and then to a warehouse for food and wine. Amongst the damage done during that period, the kings of Judah that stretch across the facade were beheaded, apparently mistaken for the kings of France. Restored in the 19th century, the beautiful and balanced façade remains the highlight of the structure today. Its angels and saints look down at the many tourists and worshipers who pass through the cathedral’s doors each day. While the exterior of Notre Dame really shines, it is the interior of the stunning Sainte-Chappelle that must be seen. It makes quite a contrast to the relatively dark early Gothic interiors of Notre Dame. Here it seems that there are no walls, only windows and a roof. A beautiful blue dominates the marvelous and amazing room built to house a relic collection of the French royal house. King Louis IX of France, otherwise known as Saint Louis, commissioned the chapel. It was consecrated in 1248, having taken less than ten years to complete. It too suffered some damage during the French Revolution, but much of its jewel-like glass remained intact and it is said to be the most extensive collection of 13th century stained glass remaining in place anywhere in the world. It creates a breathtaking room bathed in light and blue and gold. Both of these marvelous buildings were a joy to explore with my camera. 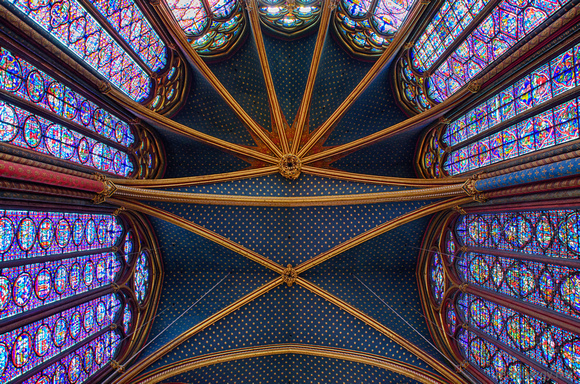 I invite you to enjoy the resulting photographs in my Notre Dame and Sainte-Chapelle gallery.